Ancient Chinese Thought, Modern Chinese Power. Yan Xuetong. Princeton, NJ: Princeton University Press, 2011. The nature of China’s “rise” or “re-emergence” has become a widely discussed topic as the United States grapples with the ever changing global order, the end of the Washington Consensus, and the beginning of the Beijing Consensus. 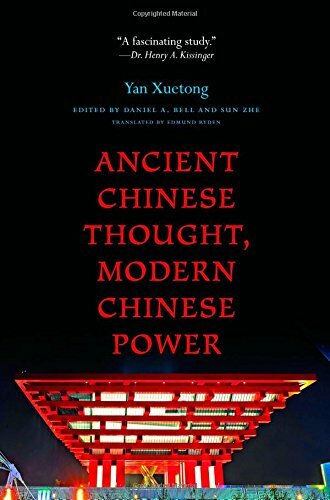 In 2011 Yan Xuetong, one of China’s leading public intellectuals, authored Ancient Chinese Thought, Modern Chinese Power which became the first major study about why and how China historically views foreign policy, the role of government, and the concept of power. Mr. Yan is a pre-eminent Chinese International Relations theorist, a well-established thinker on the global stage, and was named one of the Top 100 Public Intellectuals by Foreign Policy Magazine in 2008. His role as a leading thinker within the Chinese intelligentsia is difficult to overstate, particularly in the past decade as his profile has become globally significant. The book is an attempt to explain how the leading pre-Qin philosophers: Hanfeizi, Mozi, Guanzi, Mencius, Xunzi, Confucius, and Laozi developed the Chinese concept of “Humane authority.” Humane authority is a pre-Qin idea about the ideal basis of government. The idea suggests thoughtfully considered proposals be carried out through established norms for the good of the people. In ancient philosophy, humane authority was balanced against the concept of hegemony, in which men simply sought to accrue power for the sake of it. The key argument is that through stability, well thought out support, and a solid moral base, a government can wisely guide its people. The philosophers developed these theories during the Spring, Autumn, and Warring States periods in Chinese history as a way to interpret which forms of leadership worked well and which did not. Throughout the course of the book, the author frequently mentions how the concept of the Sage King, who listened to “capable advisors,” was an appealing ideal in Chinese culture. This is particularly a relevant point as the Chinese Prime Minister Xi Jingping, another contemporary who also came of age during the Cultural Revolution, continues to consolidate power across China and cull corruption from the ranks. The lasting impact of the Cultural Revolution cannot be understated for either men; it was an event which dramatically shaped their lives. In the case of the author, it seems to have made him a committed realist in how he viewed the world. Because of the author’s prominence, it begs the question of how much do Mr. Yan’s theories influence present Chinese leadership, or how much is he influenced by present Chinese leadership? Although at times dry, Mr. Yan makes an exceedingly well-researched argument that the philosophies of these Chinese scholars should be incorporated into the present pantheon of Western-based theories which continue to dominate international relations theory. While his points are valid, Pre-Qin philosophies were developed amongst a homogenous culture, meanwhile the majority of Western thought developed amongst a much more heterogeneous group. Integration will happen as Eastern culture grows in scope globally but overemphasizing its importance as it relates to interactions between states needs to be understood within the context of its development. Concepts that encourage stability are re-assuring to members of the military profession who find themselves sent in harm’s way. Given the so-called rise of China and the associated fears of that rise in the West, military members should take their time to read this book so as to understand what motivates Chinese foreign policy decisions. A weaker aspect of this book are his occasionally generalized comments about how American neoconservatives of the second Bush administration were working solely to accrue power for hegemonic purposes. He neglects to mention that neo-conservative views were heavily based on Democratic Peace Theory, whose proponents believe that democratic states will not go to war with one another. While the Democratic Peace Theory may be viewed by some as a Pollyannaish view of how governments interact, the central theme is that stability is critical to peace. Ultimately, this is a poor generalization that appeals only to some. While Mr. Yan is often referred to as a “neo-comm,” because this book places heavy emphasis on the importance of stability and order in global relations—especially as it relates to how China should cooperate with the United States—the author’s desire for cooperation and stability should be reassuring to those who fear a twenty-first century replication of a pre-World War I British-German arms race. While there are distinct similarities in the comparison, the acknowledgement of that threat among policymakers on both sides of the Pacific should serve as a distinct dampener upon that potential. This book should be read by all those who call themselves students of Chinese foreign policy as well as those who contemplate the future of the United States in the world. The research presented here would also be a well-appreciated addition to the annals of studies of international relations. John Barrett is a U.S. Air Force officer currently serving as a Logistics Readiness Officer at Nellis AFB, Nevada. The views expressed are the author's alone and do not represent the official position of the U.S. Air Force, the Department of Defense, or the U.S. Government.